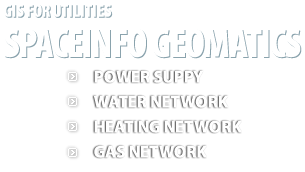 SpaceInfo Geomatics is specializing in deployment of GIS for utilities, most experienced in underground engineering networks such as heating and water/wastewater, less experienced with power supply networks. SpaceInfo Geomatics converts information to digital data: saving of basic content, possibility of actualisation of created data base, issue of solid copies "usual content"; creating of data base for all elements of utilities. SpaceInfo Geomatics executed such projects as Enterprise GIS for “Moscow city power company” (OAO MOESK branch, Moscow), cable network of “Lenenergo” (Saint-Petersburg), sewer system of “Mosvodostok” (Moscow) and others. SpaceInfo Geomatics SpaceInfo Geomatics, based in Moscow, started in 1995 and is specializing in mapping and deployment of GIS for utilities, most experienced in underground engineering networks such as heating and water/wastewater, less experienced with power supply networks.